Can anyone help? I have a silver napkin ring which is marked ‘84’ with a tree or leaf like stamp, and the initials T.H. This may be Russian silver. 84 zolotniki is a silver standard equivalent to .875. 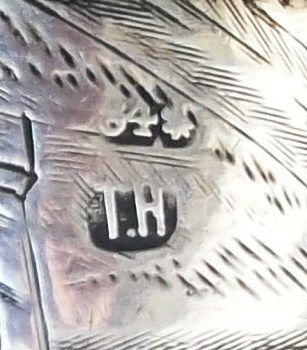 There is an unknown Russian silversmith with the initials TH and a very similar (if not identical) mark - see here. The mark next to the 84 may be the St Petersburg city mark. However it should also have an assayer’s mark so I am not confident about the attribution.